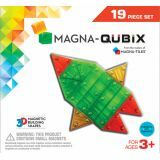 Magna-Qubix® by Valtech are 3-D Magnetic Building Blocks. Geometric shapes measure about 1x1 inch and include Hexagonal Prisms, Square Pyramids, Triangular Prisms, Cubes, and Rectangular Prisms. Each shape has magnets inside and they always "stick"! Make symmetrical structures or interesting towers. Stack, sort, and build for fun, hands-on play! 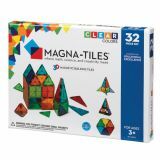 Magna-Tiles® by Valtech since 1997 are 3-D Magnetic Building Tiles "where math, science, and creativity meet". Tiles are translucent, brightly colored squares and triangles. The edges are lined with magnets and the secret is their unique ability to connect. They always attract, even when flipped! Ages 3+ use their imagination to make flat patterns, 3-D shapes, and creative constructions while learning about shapes through play.